After the Visegrad countries’ accession to the EU in 2004, one of the most remarkable developments was the sudden upturn in their mutual trade. In 2007 the value of aggregate intra-Visegrad trade was two and a half times higher than in 2003. The rate of growth in these countries’ trade with the EU 15 (the ‘old’ member states) was only half as much. Also, individual Visegrad countries showed higher export growth rates to other Visegrad members in the post-accession period than in the years before EU accession. These developments are reflected in the changes in the geographical distribution of trade. While the relative significance of intra-Visegrad trade increased substantially both in the immediate pre-accession years (2000-2003) and the immediate post-accession years (2004-2007), the shifts in favour of intra-Visegrad trade were stronger in the years after accession in the case of all four countries and in both exports and imports. Three years after the EU accession the relative significance of intra-Visegrad trade attained the level it had reached in 1985, that time still under the extreme protection from global competition provided by the CMEA. The research to find an explanation for the upturn of intra-Visegrad Group trade was primarily focused on the identification of changes in the composition of trade. This approach was supplemented by an investigation of intra-bloc trade in services and an analysis of the mutual FDI flows among the countries concerned. Various trade structure indicators (traditional descriptive, marginal intra-industry and revealed comparative advantage indicators), calculated in the framework of this research, show that accession to the EU has not brought about any abrupt changes in the commodity patterns and revealed comparative advantages. In bilateral trade relations, apart from some exceptions, the changes observed were typically continuous and gradual, overarching the whole period 2000-2007. This is, however, no reason to claim that EU accession had a minor role in the upturn of mutual trade in the region concerned – rather, the effect is not focused on the year of accession (and +/– one year). Despite the clearly hesitant attitude of the incumbent EU members towards eastern enlargement in the 1990s and the lack of their final commitment up until 2002, with the year of accession approaching it became more and more obvious that the accession would take place indeed. In this gradual process of self-conviction the firms involved in the intra-Visegrad Group trade may have gradually elaborated their new, geographically more diversified sales/procurement strategy. In the new strategic concepts of the main exporting firms (mostly multinationals) the Visegrad region itself is thought to have been upgraded both as a target for sales and as a host of potential cooperation partners for production. Results from the gravity modelling exercise indicated that there was no significant change in intra-Visegrad trade post-2004 after controlling for typical gravity determinants. Combined with the observed increase in intra-Visegrad trade these results would tend to suggest that the observed increases in trade were largely the result of the relatively strong rates of growth of per capita GDP in Visegrad countries and not due to accession per se. The results from the gravity exercise further indicate that the changes in intra-Visegrad trade have occurred mainly along the extensive margin, with a greater variety of products traded amongst Visegrad countries. Services trade was found to be too low to cause any significant productivity changes that would influence merchandise exports dynamics of the Visegrad countries. The prevalence of traditional transport and travel services in the services trade structures also points to a lower importance of services for the countries’ economies, in particular for merchandise trade developments. Our results may indicate an insufficient level of development of Visegrad countries yet, which prevents them from using services more efficiently. EU accession did not have a one-time effect on FDI among the Visegrad countries and also the comparison of the pre- and post-accession periods does not reveal any increase in the importance of mutual investments. This means that it was not mutual FDI that was driving trade. FDI among the Visegrad countries is rather low because there are not many local companies that are able to invest abroad. Those that do invest in the Visegrad area aim at serving mainly the local market of the target country, which has little trade-enhancing effect. There must be, however, a link between mutual trade and FDI from outside the region. Most of the Visegrad countries’ exports are generated by foreign subsidiaries of multinationals from the EU-15 and other developed countries. These subsidiaries are linked by intra-company trade, sourcing and selling in the Visegrad region. After EU enlargement, foreign investors have concentrated the production of consumer goods sold in the region in a lower number of locations which also generated trade among the Visegrad countries. Our analysis has an important message for the Southeast European countries, all aspiring for EU membership and simultaneously participating in the regional free trade agreement CEFTA. Facilitating the upturn of mutual trade by the governments concerned has been regarded by the EU as an important step towards membership. The research results testify that in the process of the intra-bloc trade revival the year of EU accession does not appear in the time series as a major watershed in terms of commodity patterns, intra-industry trade or revealed comparative advantage. The developments, primarily specialization, took place gradually, starting prior to and continuing after the accession to the EU. 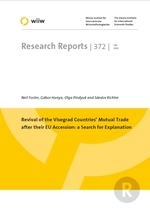 That does not exclude that the removal of administrative and other, mainly invisible obstacles to free trade on the day of accession did not support the upswing of mutual trade, but it could not be the major force behind the phenomenon as it took place in the bilateral Visegrad–EU-15 trade as well, without producing a spectacular upturn in that relation. Our assumption is that the likely driving force of the intra-Visegrad trade expansion has been a change in the networking strategy of the multinational companies located in the region around the date of EU accession. This change manifested itself in upgraded intra-firm deliveries among affiliates located in two or more of the four Visegrad countries. In this sense the increasing presence of multinational firms (more FDI projects and related inflows) is the key to rapid expansion of intra-CEFTA trade. This is, however, closely related to the prospects of the individual CEFTA members concerning the date of their EU accession. The legal stability provided by the gradual takeover of the acquis communautaire, on the one hand, and the prospects of removing all administrative and other, invisible obstacles to trade within the CEFTA region, on the other hand, are the connecting link between FDI, EU accession and an upturn in intra-CEFTA trade. Thus the summarized policy recommendation from our project for the Southeast European EU aspirants is that good progress in the accession negotiations, professional preparatory work for starting such talks and, further, the creation of an FDI-friendly regulatory environment may become key elements of a policy targeted at the upswing of intra-regional trade.